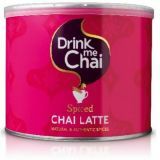 Spiced Chai has been handmade for centuries in households across the India, Zuma have now created a delicious instant spiced chai - made using black tea extract, real ginger and cinnamon. Approved by the Vegetarian Society. 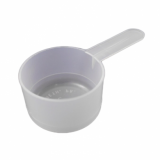 Put one scoop Zuma Chai powder into the cup. Add hot water and mix to a smooth paste. Top up with steamed milk, dust with cinnamon and serve. Zuma brand of hot chocolate was created by Bristol-based company Beyond the Bean. The Zuma range of frappes, hot chocolates, chais and toppings are totally delicious - but free from unnecessary artificial ingredients. Beyond the Bean have come a long way from their humble beginnings in 1997 when the whole business operated from their home-office and their customers were a few small coffee bars in Bristol. They now operate in 50 countries and occupy a large warehouse facility, filled with syrups, smoothies, hot chocolate and frappes - pretty much everything for a coffee shop apart from the beans. Today Beyond the Bean remains entirely independent; Jem and Nikki still own, and love, the business they built from scratch. They are supported by the fantastic team at their HQs in Bristol and Los Angeles - a team full of knowledge and passion for the Beyond the Bean range. All our staff have experience in the industry, from running coffee shops and bars to helping organise, and judge national barista championships. This means we are passionate about our products and is just as passionate about helping you get the most from them. Sugar, Maltodextin, Ground spices (5%) (cinnamon, ginger), Black tea extract (2%) Thickener: carboxy methyl cellulose, Natural Flavouring. Produced in a factory that handles soya, wheat and gluten (may contain traces of soya, wheat and gluten). 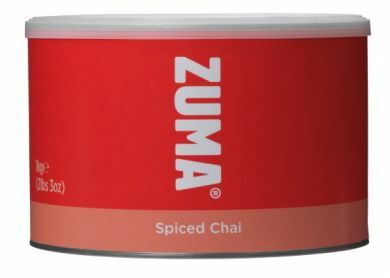 Put 1 scoop (28g) Zuma Chai powder in to a 12oz cup, add 1/3 hot water and to a smooth paste, top up with steamed milk, dust with cinnamon and serve.